It is free for web applications (desktop/laptop) & a couple dollars for the smart phone app. Note: I have no relationship with this company. The wave heights are especially neat to me, though there may be other apps out there that give the same info. I really like this site! Thanks for suggesting it. Has a lot of good information and I'm a sucker for some cool animation. Hey, I'm glad to hear that you found the information useful. There's definitely been a trend towards looking at the potential kinetic energy of storms instead of being married to the Saffir-Simpson scale. I'm sure others have raised the topic before. What really got me interested in it was spending a lot of time in New Orleans/MS Gulf Coast YEARS after Katrina and seeing the massive impacts it had on that area. Katrina was a high-end Cat 3 at landfall, but she broke the record books for damage and deaths. Ike was another storm that demonstrated that a weakening hurricane can do a LOT more than we might think given its Saffir-Simpson rating. I see it as a question of physics -- which is the underpinning of how we try to understand and predict weather in the first place. You have a certain amount of energy, and that energy has to be transferred somewhere by the storm. Frequently the wind damage pales in comparison to the storm surge. You can have two storms -- one with significantly higher wind in a tiny core -- and a second storm with a much larger area of wind even though it is less severe than the first storm. The first storm might be a Cat 4 whereas the other storm might be a moderate Cat 3, and the larger storm can do a great deal of damage over a larger area when it has much more kinetic energy. Charlie is a good contrasting example. Hellacious wind speeds just short of a Cat 5, but the storm surge was way less than typical for a storm of that intensity. Reason? The available kinetic energy was tiny compared to a Katrina or Ike. It's a different way of looking at things to be sure, but I think it has a lost of relevancy with Florence. On the lighter side, there is now a Twitter account for the flag at the Frying Pan Tower. I like to check in on this site during events like this. You can click on areas to zoom in as well. Pretty worried about flooding here IMBY. Been a very wet spring. We had a bunch of landslides back in May and worried we see a repeat. I don't know where The Weather Channel got this report but Atlantic Beach, NC has already measured over a foot of rain. Likely gusting to hurricane force here. The eye is looking rather healthy on radar, idk if it's a result of being closer to the Doppler or just wrapping up neatly. 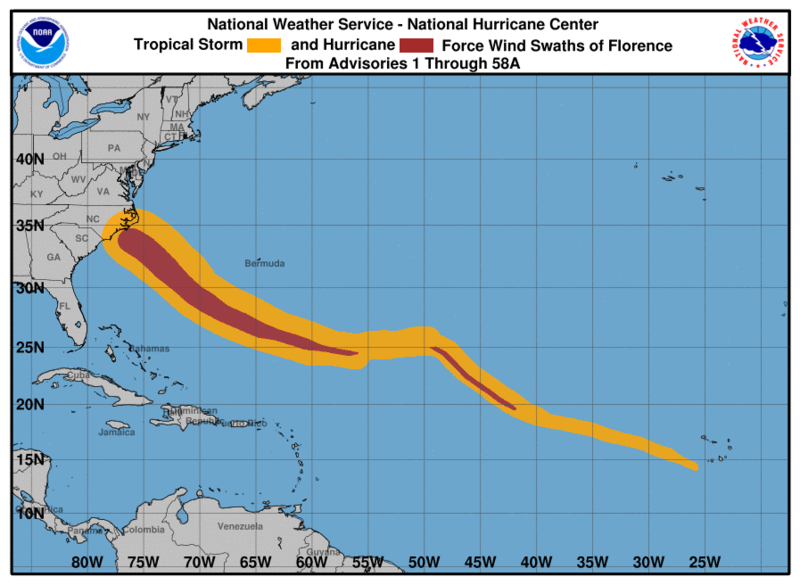 My favorite product to view for hurricanes is the wind history and it's pretty menacing. 954mb and 90mph is not a combo you see often. Goes to show you how broad the wind field is. Seismometers in New Hope, South Carolina, registering Florence's approach by the impact of its waves. If you check it now, of course, it's still jammin'. Peak wind gust I've seen was 105mph out of Wilmington's airport.